Overnight Friday Night: Mostly clear. Lows around 20. Saturday: Sun & clouds, seasonable. 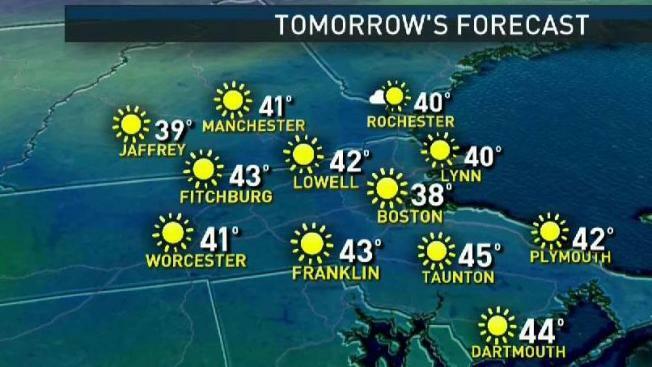 Highs around 40. Sunday: Snow to mix to rain. Accumulations coating to 2” south, 3-6” north. Highs in the 40s south, 30s north. March is off to a very cold start, with average temperatures across New England running 5 to 7 degrees below average. That cold is finally relenting though, with warmer air arriving just in time for the weekend. Highs on Friday climbed into the 30s with lots of sunshine, except for a few clouds that came in late in the day across southern New England. Those clouds were blowing off the top of a storm that’s missing us to our south. Saturday will begin with lows in the single digits and teens in northern New England, with teens and 20s in southern New England. By afternoon, many spots will be in the 40s with a light wind and blue sky. It will be a fantastic weekend to be outside, perhaps taking advantage of the deep snowpack on the slopes. Things change on Sunday as a weak weather system moves in. During the morning, as it arrives, it will be cold enough for the first wave of precipitation to arrive as snow. Over the course of the day, temperatures will steadily climb into the 30s, and even 40s in some cases. So by midday, areas south of the Massachusetts Turnpike will mostly be over to rain. North of there, snow will continue into the afternoon, before also mixing with, or changing to, rain. Because temperatures will be marginal, there won’t be a lot of accumulation before we switch to a mix or rain. In most of southern New England, expect a dusting to 2 inches of snow. In Northern New England, where snow lasts into the afternoon, it will be more like 3 to 5 inches. Monday will be breezy and still somewhat mild, with highs in the 40s, but cooler air settles in for Tuesday and Wednesday. Highs will be back into the 30s to near 40. Late week a more appreciable warm-up is expected, with 40s and 50s in many spots. Right now it looks like we turn a bit cooler just in time for St. Patrick’s Day.